Power Machinery Australia presents the Variobend AG Double Bending Machines, a Swiss/Austrian designed and engineered Double Bending Machine, which offers cost effective and versatile construction in folding heads. The Variobend AG Double Bending Machines are ideal for metal roofing and air conditioning unit manufacturers. The design of the Variobend AG Double Bending Machines can perform up and down bends with great flexibility and reduced material handling. It can also perform complex profile bends, which were not previously possible. 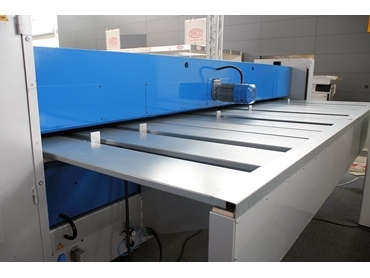 The Variobend AG Double Bending Machines consist of three variants: up and down bending machines models SB, up and down bending machines models DB and the long length folding machines models EB. The Variobend AG Double Bending Machines feature the torsion bar clamping system that ensures accurate level closing of the clamping beam even under the load of hemming operations. This also includes an opening height that is variable through the touch screen controls and allows for programmable hemming of safety edges. The Variobend AG Double Bending Machines, from Power Machinery Australia, are available in a range of working lengths from 4m – 12m and bending capacities from 1.25mm – 2.mm (mild steel).